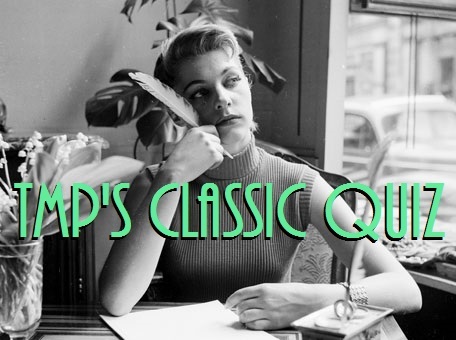 Welcome to a new feature on TMP — the Classic Quiz! One of my favorite types of film book to collect is the trivia book, so I thought I’d begin sharing questions from the ones that I own. Each Classic Quiz will contain five questions, with the answers revealed at the beginning of the next Quiz post. Take your best shot in the comments, and don’t use your ol’ pal, Google! What actress was featured in all four of these “love” movies? What TV show did Tallulah Bankhead moderate? In The Magnificent Doll, Dolly Madison was portrayed by ______. In which film did Jack Lemmon portray a French policeman? Yay, someone finally answered haha! I feared we’d make it all the way to Volume 2 with no participants. Sorry I’m late! I’m way behind on…well, everything. But anyway…I can only come up with two answers: Mervyn LeRoy for #2, and Irma la Douce for #5. And I just looked above, and saw I had the same two answers as LE!